Bowls feature:The shape is diverse, delicate and smooth, the color is bright and easy to clean. Acid and alkali resistant, convenient for high temperature disinfection. Practical and artistic. 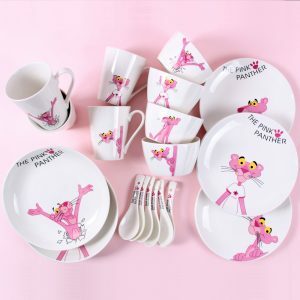 Ceramic tableware, the traditional concept of ceramics refers to all artificial industrial products that use inorganic non-metallic minerals such as clay as raw materials. It includes various articles prepared by kneading, forming, and calcining a mixture of clay or clay. 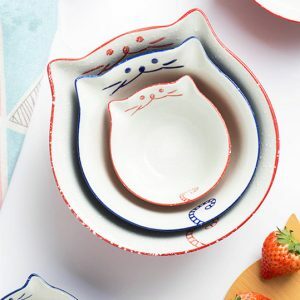 The firing and application of ceramic tableware have a long history in China. Its shape is diverse, its color is colorful, its hand feels cool and smooth, and it is easy to wash. It is very popular among Chinese people. 5. It is necessary to purchase raw materials and glaze color and glaze color tableware with strict process control. “Look”: It is necessary to observe the porcelain up and down inside and outside. Look at whether the porcelain glaze is smooth and lubricated, with or without scratches, small holes, black spots, and air bubbles; secondly, whether the shape is regular or not, whether there is deformation; three look at the picture is not deficient; four to see if the bottom is flat, it must be placed smoothly, without burrs . “Listen”: It is the sound that is heard when the enamel is gently played. If the sound is crisp and pleasing, it means that the porcelain tire is fine and compact, and there is no crack. When it is fired at high temperature, the porcelain is completely finished and the quality is better. “Beyond”: It is a comparison. For matching porcelain, it is necessary to compare the accessories to see if their shape and picture decoration are consistent. In particular, the complete set of blue and white or blue and white enamel porcelain, because the color of the blue and white varies with the firing temperature, so the same blue and white porcelain, the color is deep and shallow, a set of several pieces or even dozens of sets of cold porcelain, such as various pieces There are obvious differences in the color of blue and white, and this set of porcelain is inferior. “Try”: It is the test cover, trial installation, and test. Some porcelains have a lid, and some porcelains are made up of several components. When selecting a porcelain, don’t forget to cover the lid and try to assemble the components to see if it is suitable. Our cutlery manufacturers are able to customize high-quality cutlery and other products(such as fork, plates, cookware, tableware…), if you are interested, please contact us.